Catharanthus roseus – White flowering Vinca. 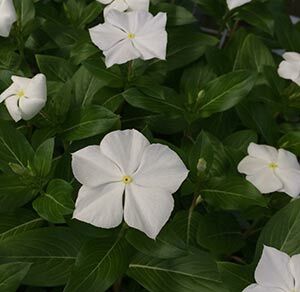 One of the very popular perennials are Catharanthus roseus, also known as Vinca and commonly called Perriwinkles. Landscaping Uses Used widely in containers, hanging baskets and pots, Catharanthus roseus or Vinca are also suited for mass planting. With many colourful cultivars available for sale, these easy care plants deserve a postion in many gardens.The new cultivars are the ones to look for and they are available for sale at nurseries and garden centers from spring thorough summer. Best grown in a warm position in a humus rich moisture retentive soil. These are plant that do cope with dry conditions, however perform better with a little water.. Flower Colour – White, Pink, Apricot, contrasting eyes and a range of colours. Height – 20cm – 25 cm Spread – 30 cm Plant 20cm apart for a dense cover. Sun Shade – Best in full sun with a little light afternoon shade in warmer, drier areas. Water – Will require extra water during long dry periods.